Where can I use this UPC? The UPC you purchase will enable your product to be quickly and uniquely identified in retail environments around the globe. Most likely you are purchasing a UPC in order to properly identify your product at small or local retailers or over the internet. Please be aware that there are some retailers, such as Wal-Mart and Kroger, who require suppliers to have their own GS1 Company Prefix in order to do business with them. If you intend to sell to these retailers, we do recommend that you invest in purchasing your own prefix. What is the difference between a digital barcode file and printed labels? If your product’s packaging or labels have not yet been produced, original barcode artwork is used. Your printer or graphic designer will take this digital barcode image and place it into your design. Conversely, if you already have printed packaging for your products, you can use printed barcode labels to adhere UPC symbols to your products. The term GTIN stands for Global Trade Identification Number. Since the mid-1970’s, North American suppliers and retailers have used UPC symbols to identify individual products and shipments. The UPC is a 12-digit number consisting of a Company Prefix and Product Number. Other countries around the world utilized a similar 13-digit number to identify products. In order to create a global marketplace, enabling all suppliers to provide product worldwide, the concept of GTIN was developed. Both UPC and EAN are forms of GTINs. To learn more about GTINs, please visit www.gtin.info. What are the Terms & Conditions for Purchases from SingleUPC.com? The UPC assignment listed above is unique and may be used solely for the identification of a single product. SingleUPC LLC manages UPC assignments to prevent duplication of usage. Buyer understands and agrees that the UPC ‘s purchased from SingleUPC LLC may not be acceptable for use with all retailers. It is the responsibility of the Buyer to determine the requirements, rules and restrictions imposed by all retailers with whom they will be doing business. Buyer is prohibited from reselling, leasing, assigning and otherwise alienating UPC’s purchased from SingleUPC LLC. UPC’s from SingleUPC LLC are assigned using a GS1 Company Prefix owned by SingleUPC LLC, and Buyer understands and agrees that it is not buying the right to use this company prefix. Buyer agrees to indemnify, defend, and hold harmless SingleUPC LLC and any related company from any and all legal claims arising out of use of SingleUPC LLC bar code numbers, including, but not limited to product liability claims, criminal prosecution, and retailer punitive fines. In order to ensure that the UPCs issued by SingleUPC LLC are unique, no refunds are available after sale is final. Failure by Buyer to adhere to any of the terms set forth above may result in cancellation of the UPC assignment. Do I need both a UPC and EAN if I plan to sell my product worldwide? The internet is full of so much misinformation. A UPC stands for “Universal Product Code” and can be read in every country. Although a UPC and EAN can technically contain the same information, it is incorrect to encode GTIN-12 in a EAN symbol. If a company is trying to provide you an EAN and UPC symbol, it should be a red flag that they do not understand product identification and coding. Am I receiving a legitimate UPC? Yes. 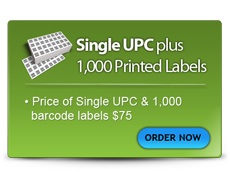 SingleUPC LLC provides you with a UPC that is unique and valid. Since our GS1 Company Prefix was obtained in August 1994, we are within our legal rights to provide individual assignments. Am I also buying a GS1 company prefix? When you purchase a UPC from SingleUPC LLC, you a purchasing a unique UPC but not a company prefix. 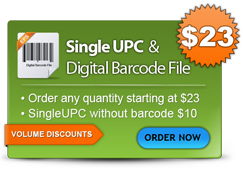 UPCs from SingleUPC are assigned from a company prefix owned by SingleUPC LLC. If you do business with a company that requires you to have your own GS1 company prefix, you will need to go directly through your country’s GS1 Organization to obtain one. For example, if the company you do business with uses EDI (Electronic Data Interchange) for sales or logistics, you may be required to obtain your own company prefix. Will my UPC assignment work on Amazon? Although we have provided UPCs to thousands of companies who currently sell on Amazon, recent changes (July 2016) in their system requires the Company Prefix to be registered to the supplier. Consequently, we now encourage prospective new clients NOT to take a chance and work directly with GS1 US.